Biodemography scientists have registered a significant lengthening of lifespan in the last 50 years. This is essentially due to the progress made in medicine and public health. Counterintuitively, the morbidity among elderly is continuously growing and the need for medical care increases with geriatric patient age.1 Also, considering the limits due to unpredictable happenings and the absence of reliable old records, the demographic trend draws a scary picture. It is estimated that, by 2050, people aged 65 or more will account for about 25% of the total population of developed countries and 15% of the people living in developing countries.2 This change in society composition will have strong repercussions in many societal policies, and a huge impact is expected in medical and health care system. Representative is the title of a paper recently published by Verrue et al33 on tablet splitting “Tablet-splitting: a common yet not so innocent practice”. This sentence resumes quite well what happens in the everyday nursing practice. In fact, tablet splitting is, most of the time, an off-label use of the medicinal product and, even if it can be considered a priori safer than tablet crushing, it can have a negative impact on therapy outcome. Given the threats associated with the practice of compounding marketed medicinal products and its wide use for dysphagic patients in hospital geriatric units and home care, we believe that the risks for the patients and the ethical and legal issues connected to these procedures are underestimated and worthy of discussion. This review focuses on concerns related to the manipulation of medicinal products and concentrates its attention on biopharmaceutical/pharmacokinetics issues and GIT toxicity that may derive from this practice. Biopharmaceutics has a fundamental role in rationalizing and improving medicinal product performances and should be taken into consideration when compounding is contemplated. Today, the presence of many modified-release formulations in the market makes the decision “whether to crush a tablet or not” more difficult and much more dangerous. So, compounding should only be recommended by HCPs with sufficient knowledge of biopharmaceutics and the proprietary information about the technology used to prepare the tablet or capsule. In fact, the first step for assessing the actual risks for the patient is to distinguish between a conventional-release (also called immediate-release) and a modified-release dosage form. Conventional-release dosage form compounding may generate faster absorption and higher bioavailability (Figure 1).44,45 These issues become more significant and extremely dangerous for the geriatric dysphagic patient in the case of drugs with a narrow therapeutic index, such as warfarin, carbamazepine, digoxin, lithium, and theophylline, for which small changes in systemic concentration can lead to significant changes in pharmacodynamics.46 Additional problems may come from the imprecision of the dose, the reduced stability in solution, and the mixing with food, beverages, or viscous gels to facilitate swallowing. 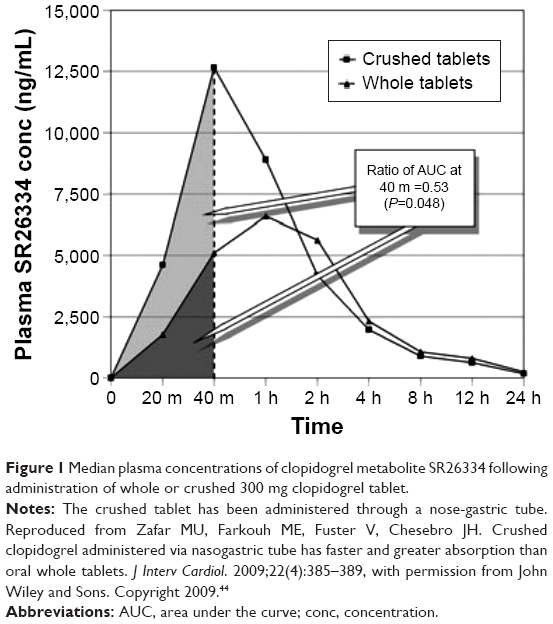 Figure 1 Median plasma concentrations of clopidogrel metabolite SR26334 following administration of whole or crushed 300 mg clopidogrel tablet. Abbreviations: AUC, area under the curve; conc, concentration. As an example, we can briefly mention the story of an 83-year-old female who died after 3 weeks of chewing rather than swallowing the intact prolonged-release diltiazem capsule, because she found it difficult to swallow.55 In another case study, Schier et al50 reported the death of a woman after repeated daily administration of crushed prolonged-release nifedipine tablet through a nasogastric tube. Her death was ascribed to severe hypotension caused by high plasma concentration of nifedipine generated by the immediate release of the entire 90 mg dose (ie, dose dumping), which instead was formulated for release over an extended period of time. However, some modified-release dosage forms have been designed to allow compounding. In a recent study, healthy subjects were administered intact or crushed capsules containing microencapsulated oxycodone or immediate-release oxycodone tablets.56 Once the capsule is opened and the microparticles are crushed, the medicine remains bioequivalent with the capsule swallowed intact (Figure 2): this makes the formulation suitable for compounding for dysphagic patients. 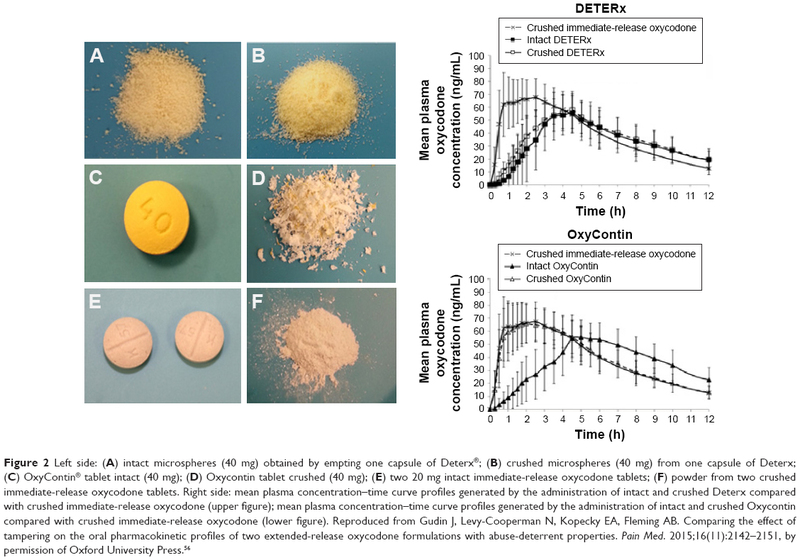 On the contrary, crushed modified-release tablets become bioequivalent to the powder of the immediate-release oxycodone (Figure 2). Drug toxicity in the GIT is a common and important medical problem linked to extemporaneous compounding that can affect part or all of the GIT, with consequences ranging from minor pathologies such as drug-induced diarrhea to perforation or fatal hemorrhage.60 The morbidity and associated medical costs due to drug-induced GIT toxicity, as well as the mortality that may ensue, are probably underestimated. A number of APIs, including ferrous sulfate,61 bisphosphonates,62 potassium chloride,63 nonsteroidal anti-inflammatory agents (NSAIDs),64 and tetracycline,65 have been identified as being responsible for GIT mucosal injuries. Sample endoscopic and microscopic views of GIT mucosae damaged by NSAIDs are shown in Figure 3. Figure 3 Sample endoscopic and microscopic views of gastrointestinal tract mucosae damaged by NSAIDs. Abbreviation: NSAID, nonsteroidal anti-inflammatory drug. To provide protection from these APIs, formulators use gastro-resistant enteric coatings made of polymers that remain intact in the stomach but dissolve and release the API in the more alkaline pH of the small intestine. Enteric coatings not only serve to prevent stomach irritation but also make it possible to delay the release of APIs that are inactivated by the stomach contents, or to delay the onset of action at a specific site within the GIT. Gastrointestinal symptoms resulting from either prescribed medications or over-the-counter drugs are frequently encountered in geriatric practice. The manipulation of solid oral dosage forms to allow easy administration in dysphagic patients may increase the incidence and severity of adverse reactions involving the upper and lower GIT. We subsequently discuss the APIs used in elderly patients that are responsible for GIT mucosal injuries, especially when the formulations are manipulated to allow swallowing. Risedronate, a third-generation bisphosphonate, seems to be considerably less ulcerogenic and fibrogenic than alendronate and may be a safer alternative for those unable to tolerate alendronate.62 In summary, given all the side effects described earlier for this class of drugs, it is recommended that tablets be swallowed whole, and are never split, chewed, or crushed, even in the case of dysphagic patients. Quite interestingly, Sinar et al73 performed a controlled multicenter investigation of the effects of oral potassium chloride supplements on the gastrointestinal mucosa. One hundred and twenty healthy men with no endoscopically apparent gastrointestinal lesions were confined to a research ward for 18 days. After the treatment was completed, endoscopic examinations of the esophagus, stomach, and duodenum were performed and evaluated by specialists blinded to the particular treatment given. Mild to moderate gastrointestinal irritation, characterized by erythema and edema, was found with similar frequency in all four treated groups. Among geriatric patients, the risk of NSAID-induced gastrointestinal complications due to long-term use may be as high as 15%.75 Although NSAIDs cause damage throughout the GIT, the predominant gastrointestinal site of injury is the stomach. NSAIDs produce two types of mucosal injury in the stomach.76 The first type of damage occurs shortly after the ingestion of the agent and seems to result primarily from local effects on the gastric mucosa (hyperemia, erosions, and/or subepithelial hemorrhages). The second type of lesion induced by NSAIDs is gastric ulceration, and it is due to their systemic effect on prostaglandin synthesis through inhibition of cyclooxygenase. The clinical consequences of utmost concern among NSAID users are symptomatic gastrointestinal ulcers and ulcer complications such as severe gastrointestinal bleeding and perforation. To prevent recurrent damage to GIT mucosae, particularly at the esophageal level, a joint effort of patients, physicians, nurses, and pharmacists is required. All patients should be advised to take the medicine only when sitting or standing, take water, and remain upright for at least an hour after administration.80 These warnings are of particular importance in elderly patients with dysphagia, or impaired mobility, such as bedridden patients. Several formulations based on NSAIDs are enteric-coated to reduce stomach irritation and minimize drug degradation. Also, in this case, crushing an enteric-coated medication exposes the GIT to the risk of irritation. Antibacterials such as tetracycline and clindamycin are the offending agents in over 50% of the reported cases of drug-induced esophageal disorders.81 Drug-induced esophagitis caused by tetracycline or derivates is often manifested in double-contrast studies by the development of small, discrete ulcers, typically in the mid-esophagus near the level of the aortic arch or left main bronchus.82 Crowson et al65 treated three patients with esophageal ulceration associated with the ingestion of tetracycline or its derivative doxycycline, and found a strong temporal relationship between taking the capsules and the onset of the esophageal ulceration. They recommended an alternative to this class, when possible, for patients with any esophageal obstructive element, and advised patients not to take them within 1 hour of going to bed. Gencosmanoglu et al83 described two different clinical patterns of esophageal injury induced by tetracycline or doxycycline, comparing these patterns with respect to demographic, endoscopic, and clinical characteristics of the patients. They analyzed 48 patients diagnosed with doxycycline- or tetracycline-induced esophageal injury who were divided into two groups according to the type and location of their esophageal lesions. They found that mid-esophageal ulceration was induced predominantly by doxycycline, whereas distal esophagitis was induced by tetracycline. This work highlighted that the type of tetracyclines taken by patients may provide physicians with some clues about the pattern of esophageal injury, because mid-esophageal ulceration seems to be more frequently associated with doxycycline, and distal esophagitis candidiasis with other tetracyclines. The prescriber has an ethical responsibility to provide patients with the information they need to make free and conscious decisions about their health care. In the case of elderly patients, who generally tend to passively accept physicians’ proposals, such communication is an especially important part of the doctor–patient relationship. Doctors must explain in understandable terms the limits of the medical intervention and the possible consequences, describe the advantages and risks that could arise from the therapy, make it clear that manipulation of the dosage form of the medicine is an off-label use, and obtain the patient’s informed consent. These are the aspects of great ethical and professional interest in working with a segment of the population that is socially, physically, and mentally vulnerable.87 The legal ramifications of off-label use, the ethical requirements to explain in understandable terms to patient’s and to obtain informed consent from those who may have limited cognitive abilities pose a considerable challenge to prescribers. The concomitant presence of different acute and chronic diseases in geriatric patients obliges physicians to prescribe a large number of medicines, most of which are sold as solid oral dosage forms; there is an almost complete absence of age-appropriate formulations that would allow personalization of therapy, especially in patients with dysphagia. Thus, HCPs in geriatric units or home care quite often manipulate solid formulations to facilitate their administration, a practice that in most cases is an off-label use of the medicine prescribed. Since the path to having geriatric tailored medicinal products on the market is neither simple nor short, physicians, in the absence of reliable alternatives, are obliged to prescribe solid oral dosage forms and advise their compounding in the hospital pharmacy. However, before taking this hazardous route, alternative solutions and possible adverse events must be carefully evaluated. The prescriber should consider the possibility of substituting the solid with a liquid dosage form or of using alternative routes of administration in a case-by-case manner. If this is not feasible, the physician, in close collaboration with the pharmacist, should evaluate the risk-to-benefit ratio of administering a compounded marketed formulation. Pharmacists should have a pivotal role in this decision, since they have a solid background in biopharmaceutics, pharmaceutical technology, and drug delivery. In this evaluation, important factors to be taken into consideration are the formulation technology, especially whether the formulation is a modified-release form (which in most cases would exclude its manipulation), and whether the APIs have a narrow therapeutic window or are irritants for the GIT mucosa. If it is decided that the manipulation of a prolonged-release dosage form is truly necessary, the dose should be evaluated carefully to avoid dose dumping. If the compounding of a gastro-resistant tablet or capsule has to be performed, particular attention should be paid to the reason/s for the presence of an enteric coating. Gastric mucosa irritation, drug inactivation in gastric fluids, and inconstant or limited absorption in the stomach are the possible motivations. If the final decision is to compound a marketed formulation, the prescriber should discuss this decision with the patient, describing the documented scientific evidence on the efficacy and safety of the off-label use of the drug (not very common in the literature), and must obtain informed consent. Then, a licensed physician or pharmacist, and not a nurse or another HCP, must perform compounding, assuring minimal API loss and the correctness of the dose in the compounded form. We sincerely hope that these actions will improve the quality aspects of medicines for older people and reduce the risks linked to the manipulation of marketed medicinal products. The authors would like to thank Sheila Beatty for editing the English usage in the manuscript. Vaupel JW. Biodemography of human ageing. Nature. 2010;464(7288):536–542. Stegemann S, Ecker F, Maio M, et al. Geriatric drug therapy: neglecting the inevitable majority. Ageing Res Rev. 2010;9(4):384–398. Singh S, Bajorek B. Pharmacotherapy in the ageing patient: the impact of age per se (a review). Ageing Res Rev. 2015;24(Pt B):99–110. Nobili A, Garattini S, Mannucci P. Multiple diseases and polypharmacy in the elderly: challenges for the internist of the third millennium. J Comorbidity. 2011;1(1):28–44. Stegemann S, Gosch M, Breitkreutz J. Swallowing dysfunction and dysphagia is an unrecognized challenge for oral drug therapy. Int J Pharm. 2012;430(1–2):197–206. Humbert IA, Robbins J. Dysphagia in the elderly. Phys Med Rehabil Clin N Am. 2008;19(4):853–866, ix–x. Fusco S, Cariati D, Schepisi R, et al. Management of oral drug therapy in elderly patients with dysphagia. J Gerontol Geriatr. 2016;64(1):9–20. Langmore SE, Terpenning MS, Schork A, et al. Predictors of aspiration pneumonia: how important is dysphagia? Dysphagia. 1998;13(2):69–81. Roy N, Stemple J, Merrill RM, Thomas L. Dysphagia in the elderly: preliminary evidence of prevalence, risk factors, and socioemotional effects. Ann Otol Rhinol Laryngol. 2007;116(11):858–865. Kawashima K, Motohashi Y, Fujishima I. Prevalence of dysphagia among community-dwelling elderly individuals as estimated using a questionnaire for dysphagia screening. Dysphagia. 2004;19(4):266–271. Holland G, Jayasekeran V, Pendleton N, Horan M, Jones M, Hamdy S. Prevalence and symptom profiling of oropharyngeal dysphagia in a community dwelling of an elderly population: a self-reporting questionnaire survey. Dis Esophagus. 2011;24(7):476–480. Hughes SM. Management of dysphagia in stroke patients. Nurs Older People. 2011;23(3):21–24. Perry L, Love CP. Screening for dysphagia and aspiration in acute stroke: a systematic review. Dysphagia. 2001;16(1):7–18. Daniels SK. Neurological disorders affecting oral, pharyngeal swallowing. GI Motil. 2006. Perry L. Screening swallowing function of patients with acute stroke. Part one: identification, implementation and initial evaluation of a screening tool for use by nurses. J Clin Nurs. 2001;10(4):463–473. Setacci C, Sirignano A, Ricci G, Spagnolo AG, Pugliese F, Speziale F. A new ethical and medico-legal issue: vascular surgery and the postoperative cognitive dysfunction. J Cardiovasc Surg (Torino). 2015;56(4):607–615. Nilsson H, Ekberg O, Olsson R, Hindfelt B. Quantitative aspects of swallowing in an elderly nondysphagic population. Dysphagia. 1996;11(3):180–184. Rivlin MM. Protecting elderly people: flaws in ageist arguments. BMJ. 1995;310(6988):1179–1182. Etzioni DA, Liu JH, Maggard MA, Ko CY. The aging population and its impact on the surgery workforce. Ann Surg. 2003;238(2):170–177. Marengoni A, Angleman S, Melis R, et al. Aging with multimorbidity: a systematic review of the literature. Ageing Res Rev. 2011;10(4):430–439. Schiele JT, Quinzler R, Klimm H-D, Pruszydlo MG, Haefeli WE. Difficulties swallowing solid oral dosage forms in a general practice population: prevalence, causes, and relationship to dosage forms. Eur J Clin Pharmacol. 2013;69(4):937–948. Stubbs J, Haw C, Dickens G. Dose form modification – a common but potentially hazardous practice. A literature review and study of medication administration to older psychiatric inpatients. Int Psychogeriatr. 2008;20(3):616–627. Haw C, Stubbs J. Administration of medicines in food and drink: a study of older inpatients with severe mental illness. Int Psychogeriatr. 2010;22(3):409–416. US Food and Drug. Available from: http://www.fda.gov/Drugs/GuidanceComplianceRegulatoryInformation/PharmacyCompounding/ucm339764.htm#what. Accessed December 1, 2015. Bonacucina G, Logrippo S, Cespi M, et al. Chemical and microbiological stability studies of an aqueous solution of pravastatin sodium salt for drug therapy of the dysphagic patients. Eur J Hosp Pharm. 2016;23(5):288–293. Sestili M, Ferrara L, Logrippo S, Ganzetti R. Detection of medication errors in hospital discharge communications of patients on enteral nutrition. Nutr Ther Metab. 2014;32(3):152–154. Kyle G. Medication management in older people with dementia. J Community Nurs . 2012;26:31. Alldred D, Standage C. Medication errors in care homes. Nurs Times. 2010;107(24):14–15. Bennett B, Howard C, Barnes H, Jones A. Medication management in patients with dysphagia: a service evaluation. Nurs Stand. 2013;27(41):41–48. Kelly J, Wright D. Administering medication to adult patients with dysphagia: part 2. Nurs Stand. 2010;24(26):61–68. Kelly J, Wright D, Wood J. Medicine administration errors in patients with dysphagia in secondary care: a multi-centre observational study. J Adv Nurs. 2011;67(12):2615–2627. Verrue C, Mehuys E, Boussery K, Remon JP, Petrovic M. Tablet-splitting: a common yet not so innocent practice. J Adv Nurs. 2011;67(1):26–32. James A. The legal and clinical implications of crushing tablet medication. Nurs Times. 2003;100(50):28–29. Kelly J, Eggleton A, Wright D. An analysis of two incidents of medicine administration to a patient with dysphagia. J Clin Nurs. 2011;20(1–2):146–155. Cornish P. “Avoid the crush”: hazards of medication administration in patients with dysphagia or a feeding tube. CMAJ. 2005;172(7):871–872. Beckwith MC, Feddema SS, Barton RG, Graves C. A guide to drug therapy in patients with enteral feeding tubes: dosage form selection and administration methods. Hosp Pharm. 2004;39(3):225–237. Boada M, Arranz FJ. Transdermal is better than oral: observational research of the satisfaction of caregivers of patients with alzheimer’s disease treated with rivastigmine. Dement Geriatr Cogn Disord. 2013;35(1–2):23–33. Salmon D, Pont E, Chevallard H, et al. Pharmaceutical and safety considerations of tablet crushing in patients undergoing enteral intubation. Int J Pharm. 2013;443(1–2):146–153. Sestili M, Logrippo S, Cespi M, et al. Inappropriate prescribing of solid oral dosage forms in elderly dysphagic patients: a retrospective study. Eur J Clin Pharmacol. 2017. Florence AT. An Introduction to Clinical Pharmaceutics. 1st ed. Press P, editor. London: Pharmaceutical Press; 2010. Buckton G, Beezer AE. The relationship between particle size and solubility. Int J Pharm. 1992;82(3):R7–R10. Ridolfo AS, Thompkins L, Bechtol LD, Carmichael RH. Benoxaprofen, a new anti-inflammatory agent: particle-size effect on dissolution rate and oral absorption in humans. J Pharm Sci. 1979;68(7):850–852. Zafar MU, Farkouh ME, Fuster V, Chesebro JH. Crushed clopidogrel administered via nasogastric tube has faster and greater absorption than oral whole tablets. J Interv Cardiol. 2009;22(4):385–389. Henney HR, Fitzpatrick A, Stewart J, Runyan JD. Relative bioavailability of tizanidine hydrochloride capsule formulation compared with capsule contents administered in applesauce: a single-dose, open-label, randomized, two-way, crossover study in fasted healthy adult subjects. Clin Ther. 2008;30(12):2263–2271. Manrique YJ, Lee DJ, Islam F, et al. Crushed tablets: does the administration of food vehicles and thickened fluids to aid medication swallowing alter drug release? J Pharm Pharm Sci. 2014;17(2):207–219. Royal Society of Chemistry. Implications of altering oral solid-dose formulations; 2011. Available from: http://dysphagia-medicine.com/. Accessed April 7, 2016. Oral dosage forms that should not be crushed 2015. Available from: www.ismp.org/tools/donotcrush.pdf. Accessed November 12, 2015. Do Not Rush to Crush/Society of Hospital Pharmacists Australia. Available from: http://www.shpa.org.au/Publications/Do-not-Rush-to-Crush. Accessed April 7, 2016. Schier JG, Howland MA, Hoffman RS, Nelson LS. Fatality from administration of labetalol and crushed extended-release nifedipine. Ann Pharmacother. 2003;37(10):1420–1423. Ferron GM, Ku S, Abell M, et al. Oral bioavailability of pantoprazole suspended in sodium bicarbonate solution. Am J Health Syst Pharm. 2003;60(13):1324–1329. Dentinger PJ, Swenson CF, Anaizi NH. Stability of pantoprazole in an extemporaneously compounded oral liquid. Am J Health Syst Pharm. 2002;59(10):953–956. Committee for Medicinal Products for Human use (CHMP). Guideline on the pharmacokinetic and clinical evaluation of modified release dosage forms (EMA/CPMP/EWP/280/96 Corr1). 2013:6. Available from: http://www.ema.europa.eu/docs/en_GB/document_library/Scientific_guideline/2013/03/WC500140482.pdf. Accessed December 10, 2015. EMA/CHMP/EWP/280/96, (CHMP) C for MP for HU. Guideline on the Pharmacokinetic and Clinical Evaluation of Modified Release Dosage Forms (EMA/CPMP/EWP/280/96 Corr1). London: 2014. ISMP. To chew, or not to chew? Patient died after chewing medication; 2016. Available from: https://www.ismp.org/consumers/chewable.asp. Accessed April 7, 2016. Gudin J, Levy-Cooperman N, Kopecky EA, Fleming AB. Comparing the effect of tampering on the oral pharmacokinetic profiles of two extended-release oxycodone formulations with abuse-deterrent properties. Pain Med. 2015;16(11):2142–2151. Habib WA, Alanizi AS, Abdelhamid MM, Alanizi FK. Accuracy of tablet splitting: comparison study between hand splitting and tablet cutter. Saudi Pharm J. 2014;22(5):454–459. Messina R, Becker R, van Riet-Nales DA, Stegemann S. Results from a preliminary review of scientific evidence for appropriateness of preparations, dosage forms and other product design elements for older adult patients. Int J Pharm. 2015;478(2):822–828. De Spiegeleer B, Wynendaele E, Bracke N, et al. Regulatory development of geriatric medicines: to GIP or not to GIP? Ageing Res Rev. 2016;27:23–36. Jain V, Pitchumoni CS. Gastrointestinal side effects of prescription medications in the older adult. J Clin Gastroenterol. 2009;43(2):103–110. Liabeuf S, Gras V, Moragny J, Laroche ML, Andrejak M. Ulceration of the oral mucosa following direct contact with ferrous sulfate in elderly patients: a case report and a review of the French National Pharmacovigilance Database. Clin Interv Aging. 2014;9:737–740. Graham DY. What the gastroenterologist should know about the gastrointestinal safety profiles of bisphosphonates. Dig Dis Sci. 2002;47(8):1665–1678. Bonavina L, DeMeester TR, McChesney L, Schwizer W, Albertucci M, Bailey RT. Drug-induced esophageal strictures. Ann Surg. 1987;206(2):173–183. Fennerty MB. NSAID-related gastrointestinal injury. Evidence-based approach to a preventable complication. Postgrad Med. 2001;110(3):87–88, 91–94. Crowson TD, Head LH, Ferrante WA. Esophageal ulcers associated with tetracycline therapy. JAMA. 1976;235(25):2747–2748. Abraham SC, Yardley JH, Wu TT. Erosive injury to the upper gastrointestinal tract in patients receiving iron medication: an underrecognized entity. Am J Surg Pathol. 1999;23(10):1241–1247. Cimino-Mathews A, Broman JH, Westra WH, Illei PB. Iron pill-induced tumefactive mucosal injury of the hypopharynx. Am J Surg Pathol. 2010;34(11):1720–1722. Areia M, Gradiz R, Souto P, et al. Iron-induced esophageal ulceration. Endoscopy. 2007;39(Suppl 1):E326. Kim ST, Kaisar OM, Clarke BE, et al. “Iron lung”: distinctive bronchoscopic features of acute iron tablet aspiration. Respirology. 2003;8(4):541–543. Jinbu Y, Demitsu T. Oral ulcerations due to drug medications. Jpn Dent Sci Rev. 2014;50(2):40–46. Rosenthal T, Adar R, Militianu J, Deutsch V. Esophageal ulceration and oral potassium chloride ingestion. Chest. 1974;65(4):463–465. Zografos GN, Georgiadou D, Thomas D, Kaltsas G, Digalakis M. Drug-induced esophagitis. Dis Esophagus. 2009;22(8):633–637. Sinar DR, Bozymski EM, Blackshear JL. Effects of oral potassium supplements on upper gastrointestinal mucosa: multicenter clinical comparison of three formulations and placebo. Clin Ther. 1986;8(2):157–163. Pusztaszeri MP, Genta RM, Cryer BL. Drug-induced injury in the gastrointestinal tract: clinical and pathologic considerations. Nat Clin Pract Gastroenterol Hepatol. 2007;4(8):442–453. Singh G. Recent considerations in nonsteroidal anti-inflammatory drug gastropathy. Am J Med. 1998;105(1B):31S–38S. Cryer B. Nonsteroidal anti-inflammatory drug gastrointestinal toxicity. Curr Opin Gastroenterol. 2001;17(6):503–551. Somasundaram S, Simpson R, Rafi S, Shergill JK, Bjarnason I, Wrigglesworth J. 2,4-Diamino-6-hydroxy pyrimidine inhibits NSAIDs induced nitrosyl-complex EPR signals and ulcer in rat jejunum. BMC Gastroenterol. 2002;2:1–7. Bjarnason I, Zanelli G, Prouse P, et al. Blood and protein loss via small-intestinal inflammation induced by non-steroidal anti-inflammatory drugs. Lancet. 1987;2(8561):711–714. Gibson GR, Whitacre EB, Ricotti CA. Colitis induced by nonsteroidal anti-inflammatory drugs. Report of four cases and review of the literature. Arch Intern Med. 1992;152(3):625–632. Bott S, Prakash C, McCallum RW. Medication-induced esophageal injury: survey of the literature. Am J Gastroenterol. 1987;82(8):758–763. Jaspersen D. Drug-induced oesophageal disorders: pathogenesis, incidence, prevention and management. Drug Saf. 2000;22(3):237–249. Levine MS. Drug-induced, caustic, and radiation esophagitis. In: Radiology of the Esophagus. Texas: Society of Abdominal Radiology; 1989:73–89. Gencosmanoglu R, Kurtkaya-Yapicier O, Tiftikci A, Avsar E, Tozun N, Oran ES. Mid-esophageal ulceration and candidiasis-associated distal esophagitis as two distinct clinical patterns of tetracycline or doxycycline-induced esophageal injury. J Clin Gastroenterol. 2004;38(6):484–489. Kadayifci A, Gulsen MT, Koruk M, Savas MC. Doxycycline-induced pill esophagitis. Dis Esophagus. 2004;17(2):168–171. Griffith R, Griffiths H, Jordan S. Administration of medicines. Part 1: the law and nursing. Nurs Stand. 2003;18(2):47–53; quiz 54, 56. Minghetti P, Palmieri I, Selmin F. When authorized medicinal products are not available: possible alternatives to meet legitimate expectations of patients. J Pharm Heal Serv Res. 2010;1(3):107–112. Mueller PS, Hook CC, Fleming KC. Ethical issues in geriatrics: a guide for clinicians. Mayo Clin Proc. 2004;79(4):554–562. Nissen L. Australian Don’t Rush to Crush Handbook. 1st ed. The Society of Hospital Pharmacists of Australia. Australia: Collingwood Victoria; 2013. Mitchell JF. Oral dosage forms that should not be crushed. ISMP. 2015:1–15. Available from: http://www.ismp.org/tools/donotcrush.pdf. Accessed April 7, 2016. Wright D, Chapman N, Foundling-Miah M, et al. Consensus Guideline on the Medication Management of Adults with Swallowing Difficulties Supplement Produced in Association with Consensus Guideline on the Medication Management of Adults with Swallowing Difficulties. Chesham Bucks, UK: MGP Ltd Location; 2006. Wrexham Maelor Hospital. General guidelines for administration of medications to patients with swallowing difficulties. Available from: http://www.newtguidelines.com/SwallowingDifficulties.html. Chesham Bucks, UK: MGP Ltd Location. EMA/165974/2013, (CHMP) C for MP for HU. Concept Paper on the Need for a Reflection Paper on Quality Aspects of Medicines for Older People. London, UK: 2013. EMA/281009/2013, Evaluation HMD and. Mandate, Objectives and Rules of Procedure for the CHMP Geriatric Expert Group (GEG). London, UK: 2013.